Home/Education, General/We have once again an apprentice of the year among our company! Our apprentice Stefan ben Ahmed (precision mechanic) is awarded as apprentice of the year! We are very delighted that he is using his qualification for further studies and wish him all the best for his future. Stefan G. (precision mechanic), also one of our apprentice, achieved the second position in the rating. We are very pleased that he will continue his professional career in our company. 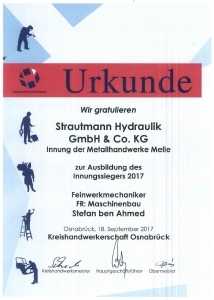 Already in 2010 Daniel K., an apprentice of Strautmann Hydraulik in fine mechanics trade, became apprentice of the year. We are very proud of our trainees, who achieved excellent results at the apprenticeship certification exams and we thank the instructor Tobias Hupe for the great support.